2 Full Marathons, 7 Half Marathons and 1 15K. Total mileage 1652. The Boston Marathon, my first and only DNF. The full report is here. It was so disappointing and maybe the only time I was ready to leave Boston. 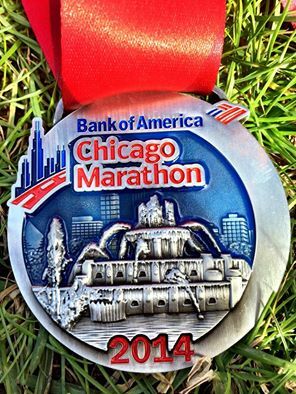 The Chicago Marathon hands down it was awesome! The race itself was pretty good, no PR but a sub 4:30 and the crown support was great. I stayed with my friend, Jamie and we would be as big as houses if we were together all the time. We both love food. Food report here. My sister Pam and niece Manami were also in Chicago. It is always great to see family and we had a great day at the Chicago Art Institute. The Frosty Half Marathon. This race was only a few weeks ago and it was very cold and hilly, but it was run by CRR, my running club in MA and I got to see so many of my old running friends. I was also less than 30 second off my PR, which keeps me hopeful for a PR in 2015. Beat the Blerch This race had some good things going for it, but the gravel trail for 12 miles made my ankles hurt for days. Next post goals and races for 2015. Do you have any races on the calendar? This entry was posted in Uncategorized and tagged Boston Marathon, Chicago Marathon, Running. Bookmark the permalink. I dont have any races yet, but i cant wait to plan it! Your year was great, way to be a running machine!